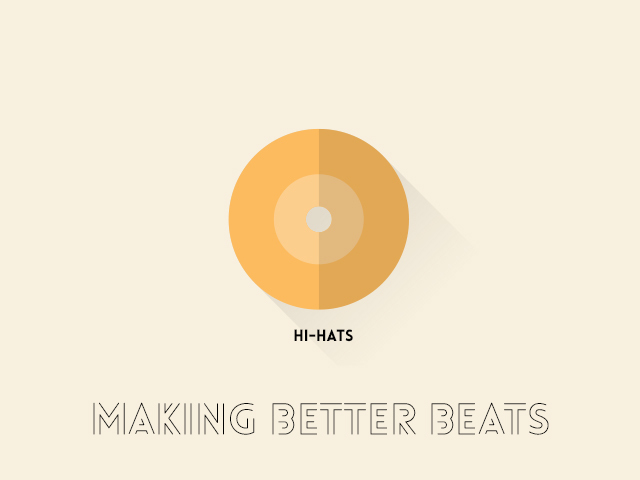 Over the last several years, busy hi-hats have rolled their way into ubiquity, becoming commonplace in songs throughout many popular genres beyond hip hop. In this article, Dubspot’s Dan Salvaggio aka curl up explores several ways to get the most out of our hats with a few simple tips! When speaking of hats, the first thing to consider is the sound of the hats themselves. They may consist of samples or be synthesized. In any case, they’re typically a higher frequency sound, with most of their energy lying above the 1kHz threshold. This frequency isn’t a rule, just a commonality of hats. When making our drum kit, I recommend utilizing several hi-hat sounds that are all quite starkly varied. For example, some may have a sharper attack than others, some may be real recordings of hats whereas others synthesized, and so on. Alternating between different hats is a great way to add some texture variation and avoid the sound of your hats getting stale throughout the duration of your track. In this example, we’ve got a very basic hat pattern utilizing two samples. Another crucial aspect of our hi-hats is the stereo space they occupy. Not only may centered hats start to get dull after a while, but they also run the risk of conflicting with other elements in your track that occupy the same frequency. This clashing of frequencies can cause your hats to ‘disappear’ in the mix. To avoid this, pan your hats! They don’t all need to be hard-panned per se, but panning several hats in different directions takes advantage of stereo space, making your song sound much wider. Here we have each of the two hats panned away from one another, adding a subtle bit of widening to the beat. Straight, repetitive, on-beat hi-hats may sound alright with decent sounds and some interesting panning, but here’s your first real opportunity to shake things up. We’re talking about syncopation, a variety of rhythms that are in some way unexpected which make part or all of a tune or piece of music off-beat. By adding a few simple changes in our hat rhythm, we’re able to change the feel of the beat, and the piece will be far more interesting as a result. Typically, the busier your hats get, the more energetic the song will feel. We’ve changed up the beat quite a bit with some much more interesting syncopation. When speaking of flow in this context, we’re referring to the ‘push’ and ‘pull’ of your hats. By speeding up or slowing down your hats, you’re injecting subtle bits of drama into your beat that will have a very strong affect on your overall piece. The most apparent example of this is speeding up your hats right before a kick or snare hit, then slowing them down again at the point of impact. Beyond making hats more or less busy, variation may also be applied to other properties such as volume. The most common practice for this is by increasing and decreasing velocity points that are assigned to the respective sample’s volume, to varying degrees. This approach is also referred to as ‘humanization,’ or making it seem a lot more like a person actually performing the hats. To take this technique a step further, it is wise to de-quantize your hats. By that, I mean pull them off of the grid, so they aren’t always hitting directly on-beat. This move makes them sound far less robotic. If you’re an Ableton Live user, you may apply a groove from the Groove Pool to your hi-hat clip to automatically alter its timing and velocity. We’ve gone quite dramatic here, alternating between three samples with varying levels of volume, all slightly pulled off-beat to add some swing.